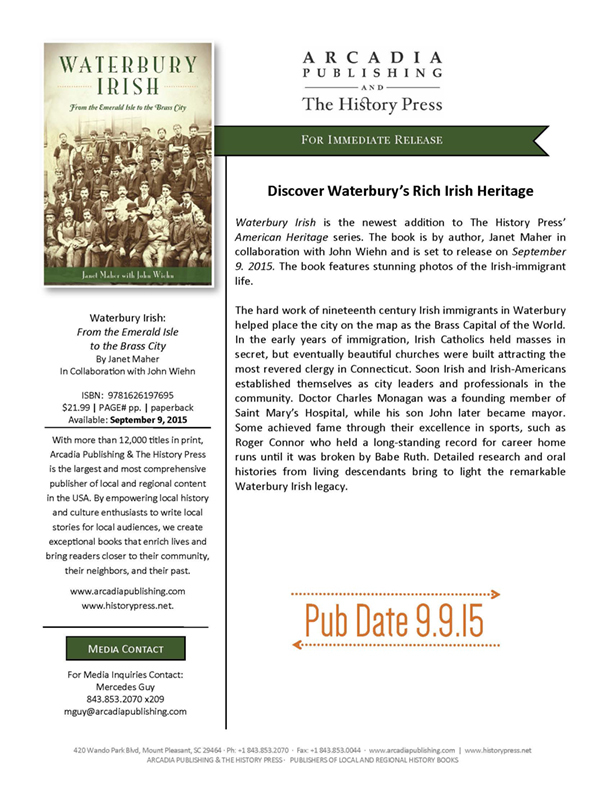 Book Launches in Waterbury, Connecticut – Coming Soon! Waterbury Irish: From the Emerald Isle to the Brass City will be officially launched on Thursday, October 15, 6 p.m. at the Mattatuck Museum, Waterbury, Connecticut! I am currently preparing a Power Point of key images for the talk, and John Wiehn will join me in presenting some of the material included in the text. Members of the Mattatuck will be admitted free. Otherwise there will be a charge of $7 at the door for adults, $6 for seniors. Many of the individuals whose family stories gave life to this work will be in attendance, and we all expect to have a “grand” time! After the event, we plan to visit The Shamrock Grill, where the owner has generously agreed to offer a 10% discount on food and drink to those who attended the talk and signing–and 20% for those who purchased the book at the Mattatuck! On Saturday, the 17th, 10:30 a.m., the launch continues with a presentation and signing at the Silas Bronson Library. At 5 p.m. that day, the Waterbury Barnes & Noble will also host a signing. Looking forward to seeing everyone at whichever event is possible to attend, and to collectively celebrate a story that deserved to be told about this important place in history! Thank you, over and again, to all who helped to make this book a reality–and to all who will support the massive amount of work that went into producing it by purchasing a copy! Sláinte! A pilgrimage is associated with a long journey that the dictionary clarifies as “especially one undertaken as a quest or for a votive purpose, as to pay homage” or one “made to some sacred place as an act of religious devotion.” For untold millions of people who have lineage in Ireland it is possible, even at the most basic tourist level, to make a pilgrimage there. Ireland, indeed, is a sacred place. Ireland is about majestic beauty and ancient history, but it is equally about the people themselves who welcome us back, understanding our craving to psychically anchor ourselves from within our ancestors’ homeland. This pilgrimage, my third journey there, was the culmination of eight years of serious, passionate, intentional research as I sought to learn about Ireland’s history and my own family lines. Traveling alone, this time was an even stronger and more focussed act of devotion in honor of my ancestors. My O’Sullivan, O’Mahony, O’Donovan, and Halloran (Ó Súileabháin, Ó Mathghamhna, Ó Donndubháin, Ó hAllmhuráin) relatives had pointed me to the general areas of Counties Kerry, Cork and Limerick. My Murphys, Ryans and Walshes (Ó Murchadha, Ó Riain/Mulryan, Middle English walsche “foreigner,” also Welch) might have been from almost anywhere in the areas in which I have traveled, so many were the instances in which those surnames appeared. But history itself and enough other clues made it possible for me to get very close to the home bases of my Meagher/Maher, Butler and Phalen/Whalen (O’ Faoláin) ancestors. It was especially for them that I drove my (ridiculously expensive) rental car 1,756 kilometers “keeping between ditches all the way,” with two additional trips, including to Dublin, in my friend Jane Lyon’s car—those times with her behind the wheel. Over these couple of weeks I visited again with friends I had met three years previously, and met “in real time” new friends with whom I look forward to remaining in contact. The power of the Internet to forge these connections and make these meetings possible has never ceased to amaze me. I have felt even more strongly, however, that my ancestors themselves have been gradually parting the Red Seas for me over all these many years. That Jane and I are now as if in parallel universes across the Atlantic Ocean, that we are joined at the hip in this quest to bridge my Connecticut research with her Irish research for particular families, and that we are in the present together (whether physically, virtually or on the telephone) is nothing short of a miracle! Irish Hospitality ruled the days of my journey. I often felt as if I was moving through a fairy tale in the place where fairies originated. Locations I had researched and sought to find were revealed to me clue after clue, person by person, each in a different way, with one detail often literally pointing to the next. As happened upon many occasions in Connecticut, I would sometimes be emotionally overcome and moved to tears right on the spot due to some revelation. It may indeed be that with this trip my great great Maher grandfather has been found! More research will be necessary, but my new friend, Oliver, seems to have pulled aside a curtain that had been drawn for decades. I will attempt in a series of posts to share the highlights of this trip. Come back again to read them. Also, please have a look at my book’s Facebook page, and consider purchasing my book, which is still available on Amazon.com or from me via Paypal or by check (P.O. Box 40211, Baltimore, MD, 21212). Remember, not all who wander are lost. The roads do rise up to meet us, the wind will be at our backs, the rains will fall softly upon our gardens, and God does—and our Ancestors do—hold us in the hollows of their hands.